Sign up and get 10 GB FREE cloud storage for your documents! 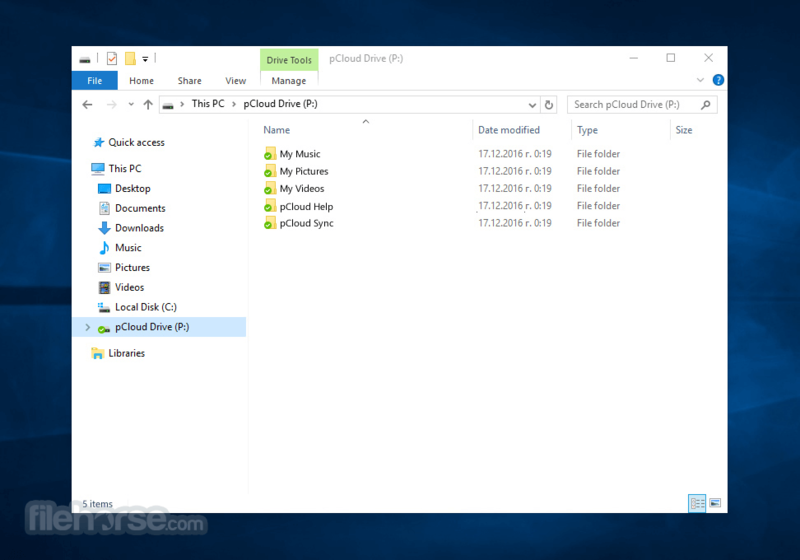 With pCloud Drive for Windows Desktop you get up to 10GB FREE cloud storage, store all your files and access them anywhere on any device. Use your files in the cloud as if they are saved on your local hard disk but without taking any space on it. 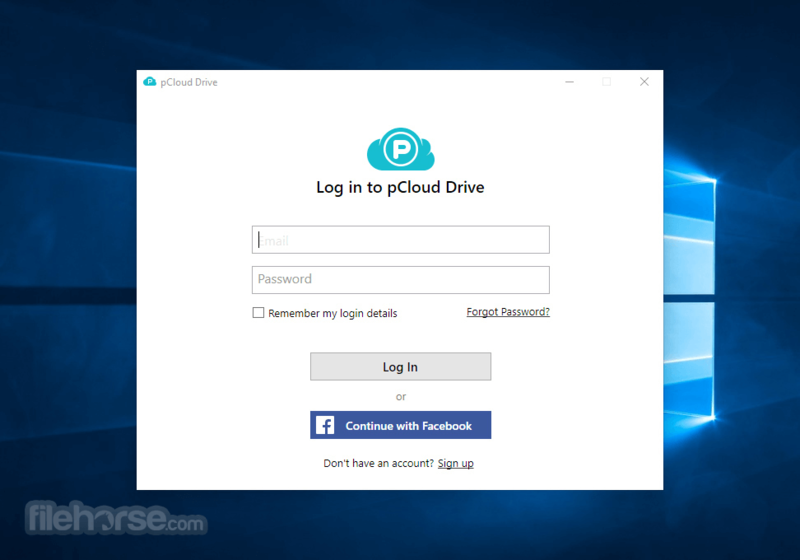 Develop your ideas on your PC without taking actual HDD space with pCloud Drive. Encrypt your private files without giving access to anyone else with pCloud Crypto. Use Automatic Upload to save photos and videos from your smartphone instantly! Use your files in the cloud as if they are saved locally, but without taking hard disk space! No matter how many files and folders you store in the pCloud, all of your data will be at your fingertips. Regardless of how you use your space in the cloud - via web, desktop or mobile - your files are truly easy to manage. Enjoy multiple file sharing options through the applications and the web interface! Whether you collaborate with users or not, your files can be sent to anyone you like. stores versions of your files for specific period of time, so don't worry if you need to find a previous version of your work. It is all available for you. Dig into the actions you have performed and easily keep track of all your activities in the cloud. "We are dedicated to providing users worldwide with unbreakable file security. With pCloud Crypto you can protect your most sensitive information, your private documents, on any device. No one, even pCloud's administrators, will have access to your content. You hold the key to your online privacy. We are confident that we have built client-side encryption software that nobody can hack. To prove this, we challenged hackers from all parts of the world. Participants from top universities, including Berkeley, Boston, MIT and 613 other organizations put our encryption system to the test. None of them succeeded!" A search field is available at the top part of the web interface and the mobile applications. Simply enter the name of the file or folder you are looking for, and it will be found in an instant. You can filter your files by their file format. The filters are the quick search icons in the left-hand side menu (for web and mobile): Documents, Images, Audio, Video and Archives. Clicking on them opens a list of your filtered files. The files you have deleted from your account will stay in your Trash folder for a specific number of days, depending on the plan you are using. For Free plans this period is 15 days. Premium/Premium Plus/Lifetime users get 30 days. Naturally, you can empty your Trash folder any time you like. By the pCloud special Invite to Folder feature, you can share folders with your friends, family and colleagues and set wether they can View or Edit content. Once users accept your invitation, they can use your files according to the permissions you have given them. You can manage your existing shares through the web platform or any of pCloud's applications. You can suspend such a folder collaboration or modify its permissions any time you like. Through It, you can generate download and upload links, which you can provide to anyone. By generating Download Links, users can easily download your data to their computers or mobile devices. By providing an Upload Link, your friends can upload files directly to your account. The Public Folder is a special folder in your pCloud's file structure, which allows you to create Direct links to files and folders. Use your pCloud as a hosting service to create static HTML websites, embed images or simply share your files the way you want. All the files you place in the Public Folder will be accessible in an index directory. It Rewind helps you go back in time and see the all previous versions of your digital collection from 15 days (Free) to 30 days (Premium/Premium Plus/Lifetime) days back in the past. Browse through your account at a specific time and date in the past and restore or download all of your non-encrypted files or accidentally removed shared content. It keeps older versions and deleted files for up to 30 days in the past. With the Extended File History (EFH) add-on, you can extend this period and recover content within a month or a year* from deleting or changing your files. If you are uncertain about the security of your photos on the social platforms such as Facebook, Instagram and Picassa, It offers a great service for you. You can start backing up your valuable memories to pCloud by just clicking a button and you can stop and resume it any time you like. Also, It is developing various plugins in order to ease your work with other platforms. You can back up your WordPress website with all files, media and database to the program. Note: In free version up to 10GB of online storage.